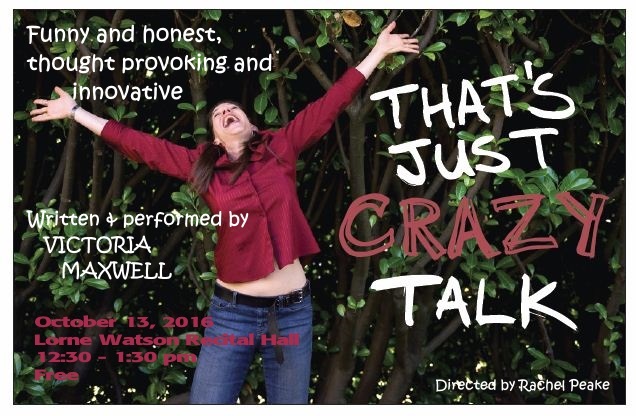 Victoria Maxwell will perform That's Just Crazy Talk on Thursday, Oct. 13 at BU. Mental health speaker, actor and writer Victoria Maxwell will perform her play That’s Just Crazy Talk on Thursday, Oct. 13 at Brandon University’s Lorne Watson Recital Hall. Maxwell has worked with actors such as Johnny Depp, David Duchovny and John Travolta, and has toured internationally with her one-woman plays. The free show runs from 12:30–1:30 p.m., in the Lorne Watson Recital Hall, located in the Queen Elizabeth II Music Building.